Welcome to a Scrapbook sort of Sunday! 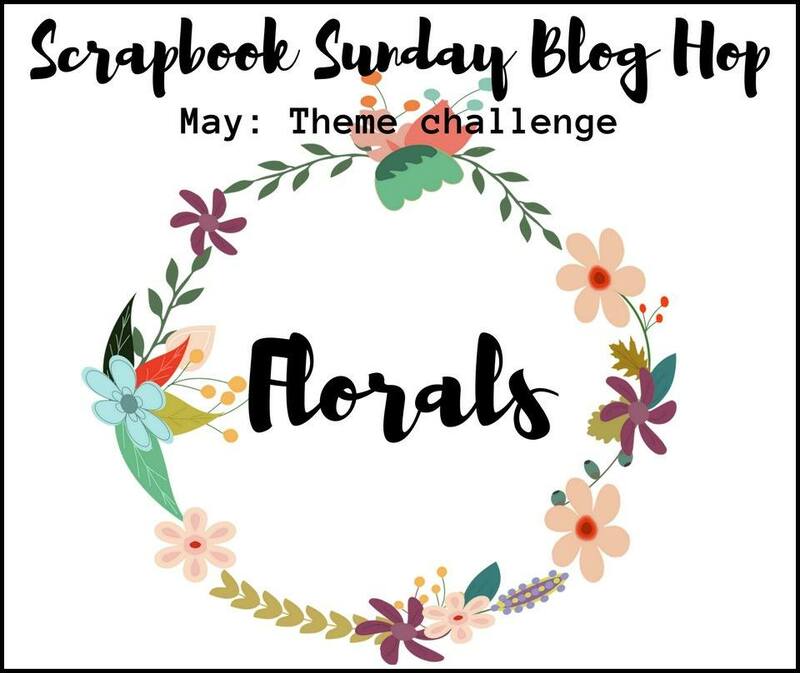 If you follow my blog, you will know I am a floral girl, so this month’s theme of FLOWERS is right up my alley. 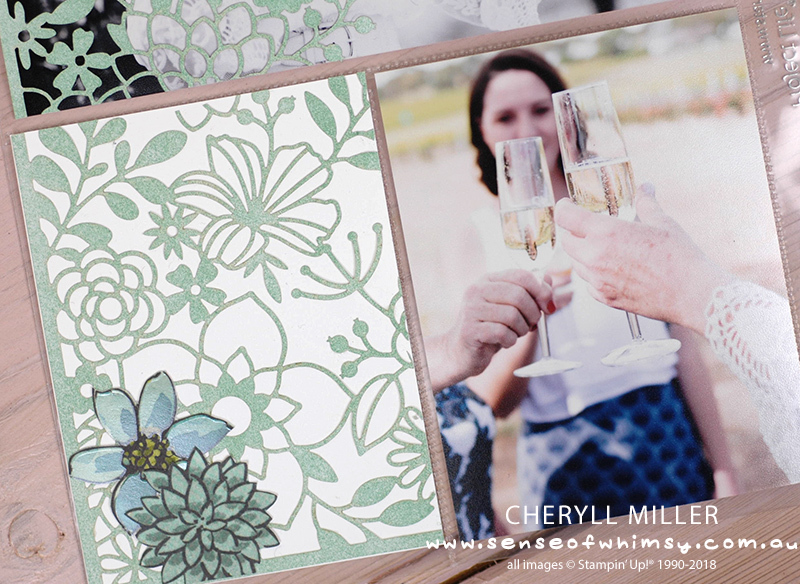 And I am sure we are in for a floral treat with this very talented group of Stampin’ Up! demonstrators sharing their memory keeping projects using Stampin’ Up! products. And look at this beautiful blog graphic from the amazing Danielle Bennenk! I am gradually building up my wedding album, just scrapping a page here and there. The theme of the wedding was very cottage garden floral, so the floral theme this month suited those pics really well. 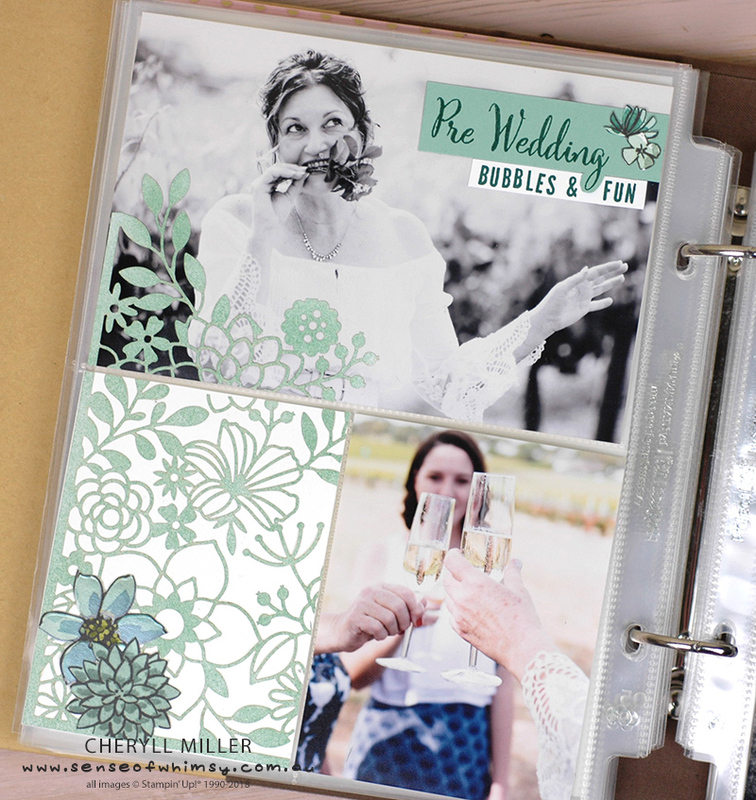 My wedding album is 6″ x 8″ pocket pages. 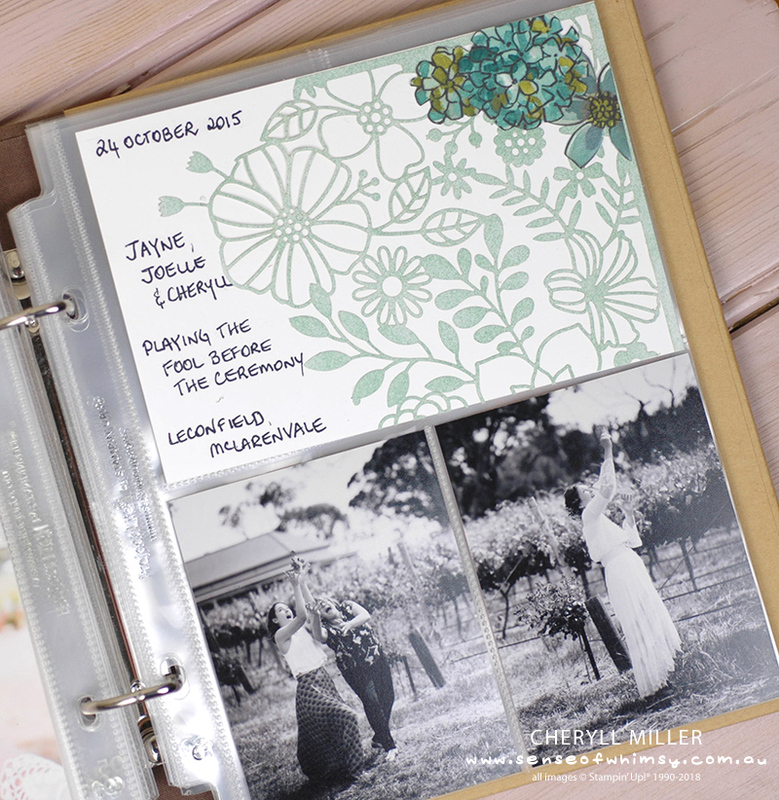 Every time I pull the pile of photos out, I reminisce on that magical day … It is the thing I love most about memory keeping, it is such a delightful walk down memory lane as you work out how best to showcase the images. I always work in double page layouts, as that is pleasing to my eye when you flip through the album, especially as I am basically using a different them for each double page layout. Today I am using the returning In Colour … Mint Macaron … and a very exciting new product coming up from Stampin’ Up!, the Delightfully Detailed Laser-Cut Specialty Paper. These are 12″ x 12″ laser cut sheets, the come in two designs. I have used the floral design and just chopped out the corners. The sheets are white on one side and vanilla on the other, so they can be sponged in any colour you please. I have added a few fussy cut flowers from the Share What You Love Designer Series Paper. Have you seen this paper? I am sure you must have, but seriously, you need to see it first hand to appreciate the addictive beauty of the designs. To adhere these delicate laser cut sheets, I used Multipurpose Liquid Glue, dabbed on to the larger areas with a tooth pick. Because the cards are enclosed in the pockets, they don’t have to be glued down all over … just be careful when sliding them into the pocket. The header is created using another new and upcoming product, the Make A Difference Stamp Set. It is an alphabet set with a myriad of options. Available 1st June. I hope you enjoyed this memory keeping project. It is great to have such a wealth of talent in this hop, providing great ideas for using Stampin’ Up! products in your Memory Keeping projects. Make sure you visit everyone’s blog. Next up is Melissa Davies. The products used for this page will be available when the new catalogue goes live on 1st June. Meanwhile, the items retiring from the current catalogue which finishes on 31st May are selling out quickly. 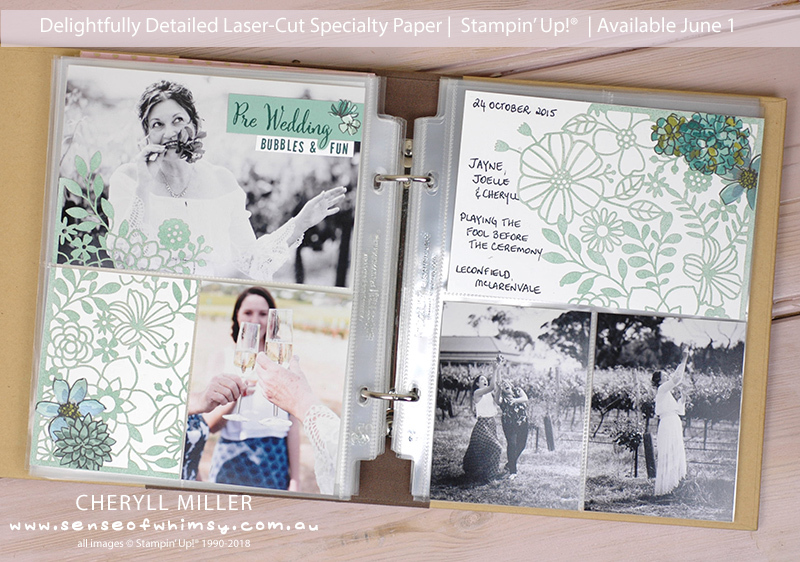 If you are in Australia and placing an order in my online Stampin’ Up! shop, don’t forget to use the Hostess Code for May to receive an extra gift at the end of the month. Gorgeous pages, Cheryll. Your album is shaping up nicely! Sooooo pretty. I truly think the Share What You Love DSP is my favorite of all time so far…well, except for Wood Textures. But definately my favorite floral! And it looks so pretty with the laser-cut paper! Beautiful! Love it! 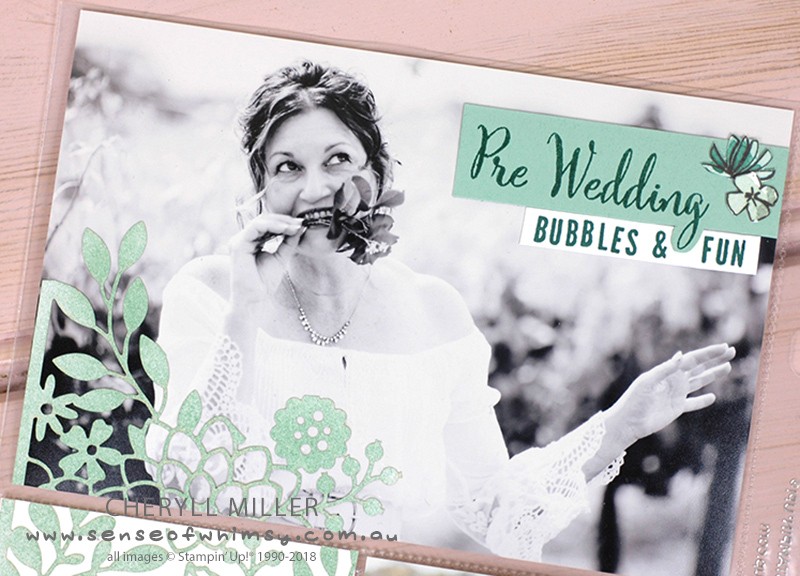 The project life pages with the Laser-Cut Paper is amazing!